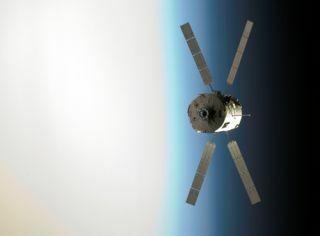 The Jules Verne Automated Transfer Vehicle (ATV) practices approaching the International Space Station on Monday, March 31, 2008. Europe's second space truck to haul cargo to theInternational Space Station has been christened the ?Johannes Kepler,? in honorof the German astronomer and mathematician. The moniker, announced Thursday by the European SpaceAgency's (ESA), continues a naming tradition begun with Europe?s?first space freighter, which launched to the space station in March 2008.That ship boasted the name of famed 19th century science fiction writer JulesVerne. "We are proud that Europe's second [AutomatedTransfer Vehicle] will carry the name of Johannes Kepler," said SimonettaDi Pippo, ESA's Director of Human Spaceflight. "A world-renowned Europeanscientist, his name reflects how Europe's role in human spaceflight andexploration is rooted in a long tradition of science and technologicalprogress." The real Johannes Kepler lived between 1571 and 1630 and isbest known as the first to correctly explain planetary motion, which hedescribed in a series of three laws. His cargo ship namesake is Europe?s secondAutomated Transfer Vehicle (ATV). Each of ESA?s unmanned ATV space freighters are the sizeof a London double-decker bus and can haul almost eight tons of cargo, or threetimes the carrying capacity of the Russian automated Progress spacecraft thatalso service the space station. The ATV Johannes Kepler is currently under constructionat EADS Astrium in Bremen, Germany, for a planned launch next year. Its namingrepresents a tip of the hat to 2009 as the International Year of Astronomy, andalso marks the 400th anniversary of the publication of one of Kepler's mostinfluential works, "Astronomia Nova." On its inaugural flight, the Jules Verne cargo ship deliveredover six and a half tons of supplies to the space station, including food,clothing, propellants, water and oxygen. It also contributed to regularreboosts of the orbital complex and even served as a temporary astronautwashroom. Verne performed a final service upondeparture by removing just under three tons of accumulated waste. The space truck successfully ended its six-month missionwith a fierydeath dive into Earth's atmosphere to be disposed of as it burned up overthe Pacific Ocean. NASA chase planes hired by ESA managed to capture the spacecraft?sre-entry on camera. ESA has considered the possibility of creating a reusablespacecraft that could bring hardware and astronauts back down to Earth. DiPippo even suggested converting ATV from a one-way asset intoa return vehicle. But for now, Europe continues to build on the initialsuccess of its current program. The ATV Johannes Kepler is slated to launch toward thespace station in mid-2010, ESA officials said.